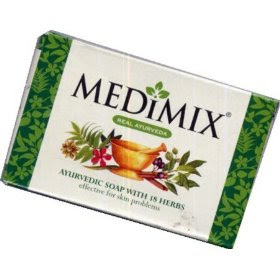 One of my favourites among natural and Ayurvedic soaps is Medimix Ayurvedic Soap. Its ingredient list includes 18 awesome herbs that are extremely soothing to the skin. The first time I tried it, I could sense that immediate difference; my skin felt so soft and clean. It’s good for acne-prone skin too; during the days that I had used it my skin was quite clear and it’s such a mild and gentle soap that my skin seemed to love it. It’s a great product to be used in summer months, especially, as it helps fight prickly heat rashes as well. I use it every now and then and definitely recommend it. I love this product because it has helped me in curing pimples, I used to leave the later for 2 or 3 minute and rinse, now I don't have any pimples. those who had used this soap speaks a lot about it! Medimix soaps are not harsh like many other soaps. Another good feature is that the fragrance lasts till the end of the soap unlike many other brands where the fragrance lingers for the first few days and thereafter there is no smell left. Medimix works off grime and dirt and tones up the health of your skin by giving it a fresh new glow. Its rich lather is enriched with the extracts of 18 potent herbs that protect from various skin problems like black heads, pimples, itches, prickly heat etc. Natural soaps are a safe and healthy alternative if you want a quality cleansing agent that simply removes the impurities from skin, without causing any damage to the tissues.